a stream is a body of water with surface water flowing within the bed and banks of a channel. depending on its location or certain characteristics, a stream may be referred to by a variety of local or regional names. long large streams are usually called rivers. light is electromagnetic radiation visible light is usually defined as having wavelengths in the range of 400â&#x20AC;&#x201C;700 nm white is the lightest color and is achromatic it is the color of fresh snow, chalk, and milk, and is the opposite of black. E.T. Magazine: How can it be that such a sensitive person doesn’t write down her thoughts ? Irina: . I think it’s due to my extreme shyness. I can’t even write a c omment or a title for my photos without great difficulty and in the end it still sounds ridiculous. I did tried to write in the past a few times. I always give up immediately though.. even writing a journal because I can’t even read what I write without blushing. Of course I end up tearing everything apart. E.T. Magazine: What is in your bag ? Irina: In my bag thereâ&#x20AC;&#x2122;s always a camera, a book, cigarettes and a huge mess. E.T. Magazine: Siblings... Irina: I have a sister. We have a strong bond. She is also my only model and apart from being relatives we are also true kindred spirits. E.T. Magazine: A dream to remember ? Irina: I dreamed about flying above a beautiful street and then entering a house with many doors, each smaller than the other. In the end I got into a room full of beautiful antiques. Since then I often dream that house and itâ&#x20AC;&#x2122;s always different. But I can never find the room. E.T. Magazine: This month... Irina: . This month has been my muse and in a way my awakening. I had a blockage for a while But the amazing beauty of the nature was all the inspiration I needed. 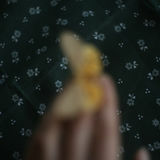 Now I see again, I am taking photos again so for me this month was truly special. This is the most beautiful time of the year and thereâ&#x20AC;&#x2122;s nothing like the autumn light. 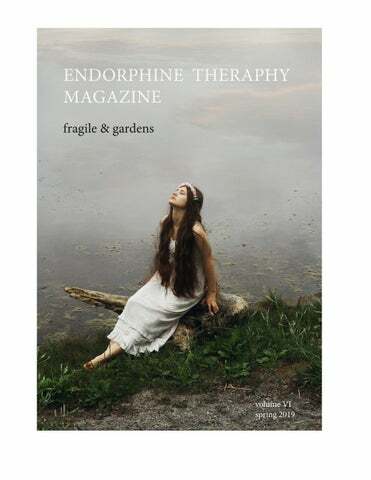 Endorphine Therapy Magazine issue VI "Fragile & Gardens"